I have always been fascinated by the Mexican celebration of Dia De Los Muertos (Day of the Dead). A large part of the celebration involves festive papier-mâché sculptures of skulls and humorous skeletons or calavera. When I moved to LA, I was introduced to works by the Linares family, who elevated the craft of papier-mâché to an art form in Mexico. (If you haven’t already, check out the life-sized tableau of Don Quixote on his skeleton horse at The Fowler Museum at UCLA). When a friend of mine suggested that we try it at one of our art dates, I said “Why not?” The basic materials are inexpensive or already at hand, many of them recycled. Sculpting, which, in my experience, had been limited to a class here or there when time and money permitted, turned out to be not only accessible but addictive. My patio became my studio, the LA Weekly my clay, and the Southern California sun my kiln. Life doesn’t get any better than this! 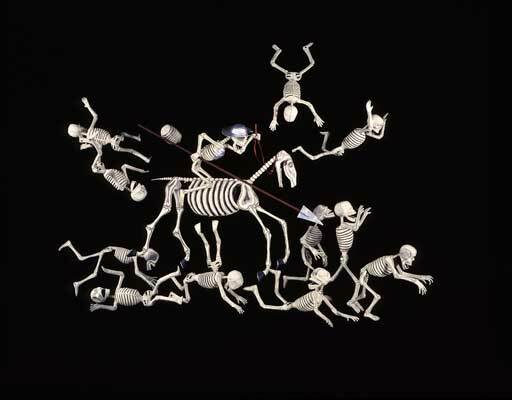 Unlike piñatas, which are hollow inside, most of the works I construct are solid with a sort of skeleton for rigidity. I do not use molds: each sculpture is unique. If you were to X-ray one of the figures you might see disposable chopsticks, plastic cutlery, wire, plastic water bottles, plant stakes, wooden dowels, paper plates, cardboard, Popsicle sticks, crumpled newspaper, and lots lots of duct tape. These are the raw materials for the underlying form. The smaller figures are one piece. For some of the larger figures I constructed the parts separately – and assemble them later in the process. After the basic form is created, the papier-mâché process begins. This is the part you might remember from childhood. The paste has three ingredients: water, flour, and a dash of salt. You boil the water and flour mixture and then add a little salt to prevent mold. That’s it. It’s amazing that these simple ingredients create such a strong glue. When the paste has cooled, you dip strips of newspaper in the paste and cover the form, overlapping the strips. The form must dry completely before adding a second layer. Whereas piñatas are meant to be broken and therefore have only a couple of layers of papier-mâché, Some of my sculptures have up to 20 layers, making them quite heavy and very durable. If you look at a cross-section, it looks like tree-rings – completing the cycle from tree-to newspaper-to wood again. Each figure contains several Sunday LA Times and a few LA Weeklies to boot, and some of the figures took months to construct. If I want a smooth finish, I add a layer of paperclay and then sand the piece. A layer of gesso and several layers of acrylic or oil paints form the final details. Depending on the piece the finish can simulate stone, wood, flesh, metal, or leather. Finally, I coat the figures in a resin fixative to protect the finish. While the sculptures are very strong, they are not weatherproof: you cannot leave them outside. However, if you keep them in a dry place away from open flames, they should last indefinitely. Check out this simple paste recipe.